The steering angle (Torque) sensor is in 99.99% the cause of malfunction of the electric power steering. You can repair the car in only 1 hour. There is no need to change the steering column! Symptoms : Vibration, Heavy Steering etc, Power steering Warning Light etc. Fiat Panda Torque sensor € 129 incl installation manual. Fiat Panda Steeringangle sensor € 129 incl installation manual. Fiat Punto Torque sensor € 129 incl installation manual. Fiat Punto Steeringangle sensor € 129 incl installation manual. Fiat Grande Punto Torque sensor € 129 incl installation manual. Fiat Grande Punto Steeringangle sensor € 129 incl installation manual. Vauxhall Meriva Torque sensor € 129 incl installation manual. Vauxhall Meriva Steeringangle sensor € 129 incl installation manual. Opel Meriva Torque sensor € 129 incl installation manual. 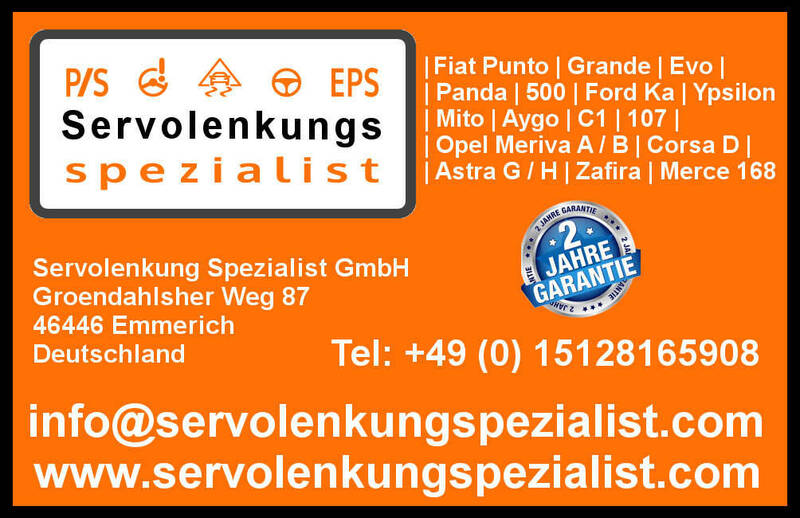 Opel Meriva Steeringangle sensor € 129 incl installation manual. Fiat 500 Torque sensor € 129 incl installation manual. Fiat 500 Steeringangle sensor € 129 incl installation manual. Ford Ka Torque sensor € 129 incl installation manual. Ford Ka Steeringangle sensor € 129 incl installation manual. Lancia Ypsilon Torque sensor € 129 incl installation manual. Lancia Ypsilon Steeringangle sensor € 129 incl installation manual. Alfa Mito, Fiat Punto Evo, Opel Corsa D, Vauxhall Corsa D you can not change the sensor. You need to order an exchange unit. It is calibrated just plug and play ! Special Offer : €249 incl. installation manual. All Prices incl Vat and excl Shipment* ! After Sensor replacement you always need to perform Torque sensor calibration. Torque Sensor Calibration is -> NOT <- possible for Grande Punto / Fiat 500 / Ford Ka with Fiat Examiner / Bosch KTS / Gutmann / Launch /Delphi / Snap- On. You need to order the Calibration OBD device seperate (loan). With our OBD device you can calibrate the Torque sensor for Grande Punto / 500 / Ford Ka. As mentioned the Electric Power Steering SENSOR in the column is a very common failure for the power steering to fail. We supply Fiat and Vauxhall specialists and main dealers with these sensors so you can be assured of the quality. Vauxhall meriva C1532 steering position sensor. Fiat Panda , Fiat Grande punto, Fiat 500 , Lancia Ypsilon Error code. - Save time. You can start the repair of the powersteering column immediately so no delay. - Total repair only 1.0 hours . - A step by step Installation guide is included with your order. Important: A very detailed Sensor installation manual is included. Please do not install the sensor Without our installation manual! changing the sensor in 1 hour only. Order Now and Go to our Shop. Please E-mail Car Chassis Nr and we will find out which part you need !